Usually as part of the gluten free 'craze', which often gets a bad rap as a new fad diet and I have debunked here, you see more and more alternatives to wheat flour available. Americans almost seem to take it as an offense, some new war against social norms that people would even think about replacing wheat in their traditional recipes, but the truth is around the world there are many similar foods baked or made with different flours. While its easy to credit the increase and awareness of living gluten free as the impetus to replace wheat in recipes like pasta, bread and other bakery, other sources of flour have been around for centuries especially in non-European cultures, but yes also in many European traditional recipes. For example, rice and buckwheat noodles are common in Asian fare, of course corn flour is used in South American fare, almond flour is used in a lot of Euro baking (like one of my favorite sweets: macaroons), chickpea flour is common for flatbreads in different regions, and more. Besides avoiding wheat, there are other reasons to look at other options. There may be specific vitamins or other nutrients you want to add to your diet, even if you are simply trying to limit your carbs, there are good alternatives. Of course each of them has its own qualities and none, not even a combination, will ever fully duplicate the final product of wheat recipes, but if you aren't looking for an identical replacement and open to new flavors, textures, and nutritional value you may want to take a look at the wide variety of flours. If you are eating sans gluten, whether Celiac or not, or even if you do eat wheat but want some different sources of fiber and other nutrition, there are many different sources of flour that can be used in place of wheat or in their original recipes. The hardest thing to duplicate is bread as the gluten in wheat is what gives it its stretchiness to rise and maintain shape for light, fluffy bread, however there are ways to get around that such as mainly Xanthan gum. You can even make homemade artisinal bread without wheat - the popular Breadin5 (minutes a day) authors have instructions to baking gluten free here. Below is a list of some of the more common flours and uses old or new for them to give you an idea of where to start if interested in exploring beyond wheat. It is not a recipe area or full guide, just a few notes on each from my knowledge and experience with the names of some common traditional recipes, you can easily find other resources and recipes online. Almond - Much different than the other flours, being from a nut, almond flour (as well as other nut-based flour) isn't quite as versatile in recipes (mainly breads) but the ones it is used in are tasty and nutritious. Sweet baked goods like macaroons & cookies are common in Europe, even in cakes and muffins. Though on the sweet and heavy side, almond flour can be used for things like pizza crust, pie crust and other recipes. Almond flour of course has all the good nutritional benefits of almonds, with more nutrients per serving than any other tree nut: it is a rich source of the B vitamins riboflavin and niacin, vitamin E, and the essential minerals calcium, iron, magnesium, manganese, phosphorus, and zinc as well as dietary fiber, monounsaturated fats, and polyunsaturated fats (the good fats). Buckwheat - though the name has 'wheat' in it, it is not even a grain or grass and is thus gluten-free. It is of course used in pancakes which are an American tradition, not only wheat free, a traditional recipe like this is egg, dairy, and refined-sugar free. Many other cultures have thin, almost crepe-like all buckwheat pancakes. But buckwheat is also used as mentioned in Soba noodles (if celiac be careful though, many brands sold here also contain wheat), even as a porridge called Kasha. It is a rich source of protein, dietary fiber, four B vitamins and several dietary minerals. Coconut - Coconut flour is one of the more popular replacement flours. It is versatile and one of, if not the, healthiest flours and foods in general. Unlike other flours, and the prominence of coconut for other uses, it seems to be one of the more recently developed flours, actually first as a 'leftover' from the production of coconut milk. It is naturally sweet which means you can often reduce or even eliminate added sweetener, it is very high in fiber and also has a lot of protein and healthy fats. It also has a very low glycemic index. Best used for sweet baked goods, it works great when mixed with other flours. One tip - coconut flour absorbs a LOT of liquid and egg and other liquid content in recipe needs is much higher. Corn - Probably the most well-known alternative due to its roots in South American cooking, there are many uses for corn in flour, meal (a coarser grind), and masa (the basis for tortillas & chips) that can be used like wheat based goods. Corn bread (though often made with other flour you can make all corn or substitute wheat for a different alternative), polenta, grits, fish and corn dog batter, and many corn puff snacks. It is not the healthiest of flours, very high in carbs (not in a good way) but it does have some nutrients like niacin and and thiamine and has high levels of antioxidants. Garbanzo (chickpea) - Flour made from garbanzos, also known as chickpeas, is also called besan or gram and has been widely used outside the US, particularly in the East. Gram flour is a staple in the Indian sub-continent. It is used for baked goods and as a batter, flatbread being one of the most common uses, since it doesn't have to rise like a loaf. Socca is flatbread made in France, usually a part of street food. Since it is made from a legume, it is naturally high in not only fiver but also protein and has many other health benefits. Oat - Other than corn, oat flour is probably most well known as well as whole oats like rolled or steel-cut, famous for the hot oatmeal breakfast porridge and cookies. It is one of the easiest to directly replace wheat with without a big change in taste or texture. Oat flour bread is hearty, nutritious, and if mixed with another lighter flour like rice flour can be nearly indistinguishable from a whole grain wheat bread. Oats are of course know for being heart healthy and good for diabetics and surprisingly has a lot of protein in addition to all the fiber. Rice - Rice is, other than corn, perhaps the most widely known and used grain even over wheat, even in the US. Of course we know it used whole grain either white or brown, or even wild, but it can be ground into a flour with many uses. Rice noodles are common in Asian cooking, and rice flour makes a great batter - very crispy - Tempura batter made solely with rice flour is perhaps better than wheat flour. It works especially well blended with other flours to lighten them up. Unfortunately even more so than corn, rice is not very nutritious with almost over half again as many calories as wheat flour with little nutrients. Sorghum - Sorghum is an ancient grain, used over 5,000 years ago, and has many uses and recipes around the world and is considered the “fifth-most important cereal crop grown in the world,” according to the Whole Grains Council and the 3rd most in the US partly because of its use as a feed grain. It is now becoming 'discovered' in the US for more uses such as baking, but also is a great alternative for the wheat related grains used in brewing beer. It is another common flour used for flatbreads and also is a great replacement thickener for soups and other recipes but can be used especially as a blend for bread, cakes, and cookies. It is high in protein, iron, B vitamins and dietary fiber and is low on the glycemic index. Hopefully you can see that these flours aren't just a replacement for wheat, but their own stand-alone ingredient for many great recipes, but yes you can also try standard wheat-based recipes with different flours or flour blends. 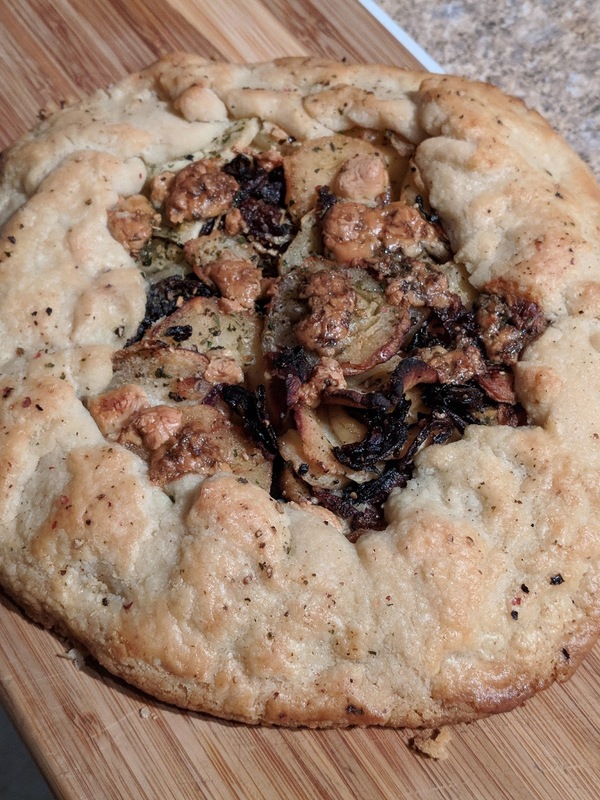 Below is one way to use 2 different flours, a take on a traditional recipe. Buckwheat pancakes are a traditional recipe, found in many different countries and fairly popular in America, one that always has had zero wheat flour in it and thus is 'naturally' gluten free. They are a tasty change from wheat pancakes, and always have and will be different in texture and taste, but that's not a bad thing Variety is the spice of life as they saying goes. 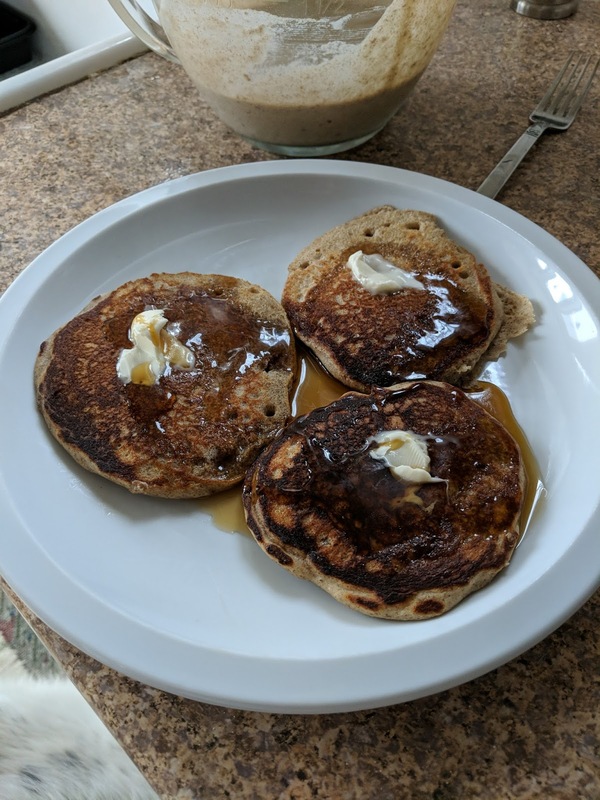 I adapted this recipe from a standard buckwheat pancake recipe. All buckwheat is fine but replacing 1/4 of the volume with a different flour adds a bit of fluffiness, mellows the flavor, and adds other nutritional value. I also added flax seed meal for additional nutrition. Beat wet ingredients together in small bowl (buttermilk, egg, and vanilla). Combine wet ingredients into dry in large bowl. Whisk together until combined. Let batter rest for 5 minutes until bubbles appear on top. Add oil or butter to griddle on medium heat. Drop mixture in whatever size pancake you want onto griddle, cook 3-4 minutes on one side until edges start to become golden and bubbles appear on top. Flip pancakes and cook additional 2-3 minutes.